Da, ali samo ime kaze - naucno fantasticni. Dakle, zasnovan na naucnim faktima. Kako ne razumijes tako jednostavno stvar? Nijedna piramida nije istrazena i procitana do kraja... to se predaje na fakultetima arhitekture sirom sveta. Na šta konkretno misliš? Ako govoriš o zapisima, to je zato što su neki oštećeni, a ako misliš na to da mnogi kulturni spomenici u Egiptu, a ne samo piramide, nisu dovoljno istraženi, to nije nikakva novost. Na više mesta gde vode turiste ima delova gde se vrše iskopavanja, ali to ide sporo, delimično zbog nedostatka novca, a delimično i zbog toga što egipatske vlasti ne žele da ostave na izvol'te poluotkopan lokalitet na koji će doći veseljaci sa pijucima i eksplozivom koji žele da pljačkaju grobnice. Isto tako, nije nikakva tajna da postoje i mnoge građevine za koje se još ne zna ko ih je gradio ili šta sadrže, a koje su bile na televiziji, sa gomilom kamera, armijom arheologa i do nedavno sa sveprisutnim Zahijem Havasom. Ovde nema nikakve mistike, već samo treba pustiti arheologe, istoričare i ostale stručnjake da odrade svoj posao i da kapne neka parica za istraživanje. Nije čudno ni što mnogo toga i dalje leži pod peskom, jer Egipat je ogromna zemlja koju treba istraživati, a istraživanja koštaju i traju. Zemljište je takvo kakvo jeste, pustinja je svuda okolo, pa je i normalno da pesak prekrije nešto što je napušteno pre ko zna koliko vekova. Ne sećam se tačno za koja mesta važi (Ironside, ako znaš, pomozi) da neke prostorije nisu smeli ni da diraju zbog narušene statike ili nekog sličnog razloga, jer se ne može tek tako opaliti pijukom po prastaroj građevini. Konačno, arhitektura, arheologija, građevina i egiptologija nisu isto. Čovek je objasnio šta se radi na arhitekturi, a za ostatak priče o piramidama treba konsultovati i arheologe, istoričare, egiptologe, stručnjake za jezik i slično. Više je faktora zbog kojih je rizično primjenjivati invazivne arheološke metode na egipatskim nalazištima; tokom milenija svaka građevina, bez obzira na kvalitetu gradnje gubi strukturalni integritet, tj. postaje manje ili više statički nestabilna. Osim propadanja materijala, razlog je i pjeskoviti teren na kojem su građene, pa dolazi do nejednakog slijeganja. Praktički svaka grobna komora ili podzemna prostorija je nestabilna i zbog činjenice da u drevnom Egiptu tehnologija konstrukcije pravog svoda nije bila poznata, barem ne do XXVI dinastije, što je oko 2000 godina nakon dovršetka izgradnje piramida u Gizi. Za VP2, u spoileru je na prilično dostupan način uglavnom objašnjena tehnologija transporta i konstrukcije velikim kamenim blokovima. Inače, procjenjuje se da je Keopsovu piramidu gradilo između 15000 i 40000 radnika (ovisno o fazi gradnje) u periodu ne duljem od 10 godina. 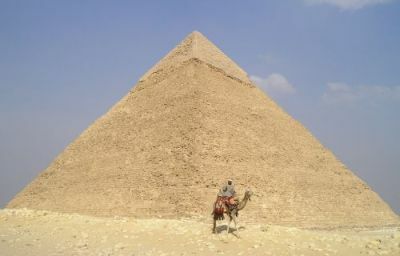 The Great Pyramid currently measures 138 m high which is the equivalent of a 46 storey building. It was the tallest structure that humans had erected until the building of the Lincoln Cathedral spire (UK) at 160 m in AD 1311 (over 3,500 years later). It is just under half the height of the Eiffel Tower (300 m to its roof) built in 1888. It is close to half the height of Australia’s 3 highest structures: Sydney’s Centre-point Tower (305 m), Melbourne’s Eureka Tower (297 m) and Gold Coast Q1 building (275 m). However, it would take exactly 6 Great Pyramids to reach the top of the current tallest building, Burj Khalifa (Dubai Tower), in the Middle East, which is 828 m high and was built in 2008. The volume of the Pyramid would fill the Empire State Building in New York 2.5 times. A regular and fast rate for the delivery and placement of the estimated 2,300,000 stone blocks. The accepted time frame of construction is between 20–30 years. Some have proposed shorter periods with a required delivery rate of 3 stones per minute. The 203 courses of masonry must be accurately leveled and the level must be maintained to accurate tolerances through the entire construction. The slope angles of each corner of the pyramid must be accurately measured and the slope must be accurately maintained. Any deviations in slope would have a catastrophic effect as the level of the pyramid rose higher. The slope face angles on each of the four sides needed to be accurately checked and maintained. This would have been critical for the placement of the limestone casing stones that covered each side. There is debate about the materials used for the stone blocks. Some advance the idea that they were cast ‘polymer’ concrete (in situ). The conventional understanding is quarried stone. The casing stones and the chamber-forming blocks are large quarried stones. Either way, they represent large volumes of material and these large stone blocks had to be lifted to great heights. Figure 2. An example of a single stage ramp to the top of the pyramid, an unlikely scenario. This is in the Pharaonic Village in Cairo. Many different proposals have been suggested to reach the height required. Most of these involve complicated ramps and do not meet the requirements listed above as they cover the critical sight survey lines. 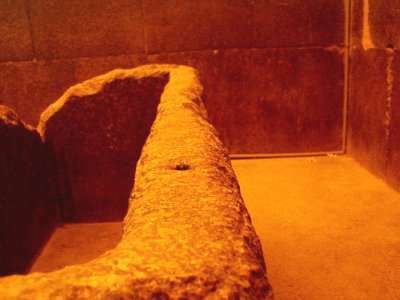 A full ramp to the top at 138 m has a certain appeal, and such a ramp is illustrated in a model in the Egyptian Pharoanic Museum (figure 2). However, a ramp to the full height would be huge in scale and impractical. It would require much more material than the pyramid itself and involve an enormous effort to build and dismantle. It could not be built with sand or gravel as this would spread under its own weight. An engineered ramp of mudbrick would also be massive and not very feasible. Therefore, I have discounted the idea of a ramp to the full height. The idea of an internal spiral tunnel by French architect J.P. Houdin and supported by archaeologist Bob Brier is another proposal aimed at getting a ramp to the top.3 This suggestion is impractical for many reasons, including the structural requirements of the pyramid. It would greatly weaken the structural integrity of the pyramid due to the massive forces resulting from forming the shape. It would not be practical from a logistical point of view, in that it would be difficult to haul 40- to 60-tonne stone blocks up through such a confined passage. The rate of stone delivery would be too slow with only one path for materials movement. I propose that a two stage approach to the construction, that meets the engineering requirements listed above, successfully explains how they got to the top. The first stage involves a construction ramp to a critical level part way up. The second stage involves forming ‘tiered platforms’ in the structure to enable materials to be lifted for the upper levels. A ramp on the southern side would provide the shortest distance from the quarry to the Pyramid site, a key factor for the efficient delivery of such an enormous quantity of stone material. The source of most of the building stones is the large quarry 500 m to the south (figure 3). The northern side is discounted because it has the only entrance way into the structure. Engineering restraints suggest the main ramp reached only part way up the pyramid. 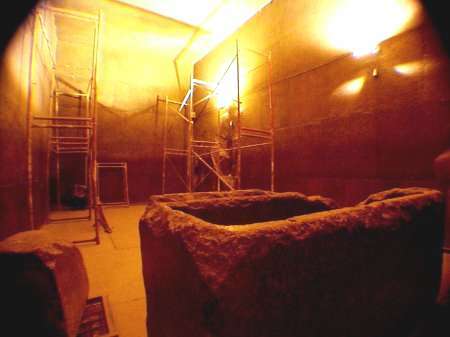 It is proposed that the ramp was only to the 64-metre level approximately, which is the level needed to raise the heaviest stones that were placed above the King’s Chamber (approximately 60 tonnes). From an engineering perspective, a ramp built to this level is practical and possible using simple construction materials and techniques such as battered (splayed) mud brick walls. This technique has been found at other pyramid sites but on a lesser scale. 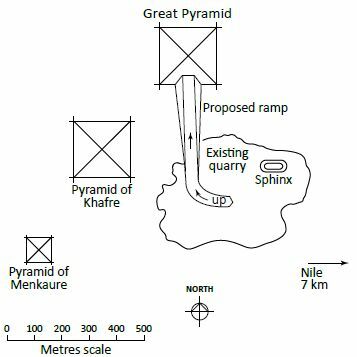 The southern ramp would need to extend 512 m from the quarry to the pyramid, which means the maximum gradient reached at the 64-metre level would only be of 1:8 (64 m in 512 m, figure 4). This gradient is quite acceptable for people and animals to climb. Many modern-day car ramps are constructed to this gradient. Figure 4. Concept of the dual construction ramp for the Great Pyramid to its maximum ramp height of 64 m.
A ramp that allows for continual adjustment in height for each level is required as the work proceeds. Maintaining a continual rate of delivery of people and materials is a challenge. Given the logistics, a four lane carriageway would be ideal to ensure this. More lanes could be provided at the lower levels. This structure could have been constructed as a ‘dual ramp’, which would permit a continuous delivery of materials to the pyramid even as the ramp was being built up. The design allows delivery of materials utilizing one side of the ramp while the other side of the ramp was being raised—then vice versa. Thus a continual flow of materials and workers can occur while the ramp structure is raised in tandem. The building stones could be mounted on metal sleds at the quarry and then carted by animals the whole distance up the ramp, onto the stone platform and close to the required position. This ramp could be made with materials readily available in the area. Mud bricks made on the banks of the Nile adjacent would be the bulk of the material. On the sides of the ramp they could be battered (sloped) at a nominal 60 degrees to give stability. The volume as proposed is approximately 760,000 m3. Any large building site needs a large working area. The delivery of materials and amenities for workers must be near the works in progress. With the ramp proposal it allows a very large flat area at the top at each stage to give this function (figure 5). Figure 5. North-south cross-section of the pyramid illustrating the two-stage construction method with construction ramp to the 64-metre level and stone lifters above. Also shown are some of the internal features of the pyramid, including the subterranean passageway. As it rises, this platform narrows so it is important to establish the required platform for the second stage of the proposal, which I will discuss later. At 64 m, a working platform of 24 m by 50 m is possible. This is a key factor in understanding the logic of the proposal. The proposed 64-metre level represents the point below which 80% of the volume of the pyramid had been placed—only 20% of the volume of the pyramid is above it. This statistic was pointed out by John Romer and is an important factor.6 This means that the bulk of the building’s stone can be carted close to the placement area by animals. Humans are needed only for the final positioning. No grunting, heaving Egyptians would be needed, as shown in many cartoons. Oxen can haul the massive 60-tonne stones that are found above the King’s chamber. No grunting, heaving Egyptians would be needed, as shown in many cartoons. The animals can also deliver all the stones for the remaining height to this last working platform at the 64-metre level. An estimated 144,000 limestone casing stones up to 2.4 m thick covered the entire surface of the Great Pyramid to form a continuous smooth polished surface. These casing stones are so precise in placement and jointing that no penetration of the surface was made for 3,000 years. The first recorded modern entry was Al Mamun, the Cairo Caliph who tunneled an entry in AD 832. The Greek historian Herodotus wrote of a large ramp on the east side. Indeed evidence has been found for the causeway on the eastern side. However, I suggest that this east-side ramp was not the main ramp for building the Pyramid. It is more likely that this ramp was at the end of the delivery road from the harbour to the Pyramid site for the casing stones. These are proven to have come from the other side of the Nile.7 At a later time the east-side ramp may have been utilized as a processional ramp—hence the remains. Herodotus says that this ramp was 10 years in the making which seems a long time for such a modest structure. Ten years would be a better time frame for building a southern ramp for the main construction as proposed. Figure 6. The core masonry of The Great Pyramid has a distinct hollowing, as much as 94 cm (37 inches) on the north face. It is not normally observable and can only be seen when special lines of sight are taken. In the above illustration (after Tompkins, ref. 7, p. 110), the hollowing of the core masonry is greatly exaggerated to show the effect. A. Pyramid base as actually built. B. Base of core masonry. This deviation in the stonework makes sense as it enables accurate checking by sight lines from corner to corner for each course. The perimeter casing stone course was also rigid with a thin bed of mortar found to join each stone. This course was accurately aligned to control the geometry of the shape. The stones were leveled very accurately to the horizontal which then provided the gauge for the infill stonework behind. With this technique, once the perimeter course is in place it acts as a safety barrier and datum allowing for the rapid infill of the inner core. Work can also be done in different parts of the course level at the same time. Another factor with working on one course at a time is that portable shade structures can be provided at any part of the building site enabling work to progress in hot conditions for the whole of the year. Figure 7. Southern elevation of the Great Pyramid showing the construction ramp with mud brick battered walls at its maximum height. Figure 8. Variation of the block thickness for each layer of the Great Pyramid from its base to its present summit (after Romer, ref. 2, p. 367). Above the 64-metre level a different approach would be required, as the size and slope of the ramp would have reached its maximum practicable level (figure 7). The remaining 20% of the blocks for the pyramid would now have to be placed in a steep structure for the rest of the height of 74 m (25 stories). It is important to note that above this level the stones become smaller and lighter (figure 8), which means they could be handled by a different construction technique. The existing stepped courses of the Pyramid have ledges averaging about 600 mm in width and a height about 700 mm, resulting in an incline of about 51 degrees, which is very unworkable. Even with staggered scaffolding this can be dangerous. Figure 9. Forming the vertical tiers, central south side only. Figure 10. Lifting devices with the tiered layers. Figure 11. Infill of the tiers and placement of the casing stones from the top down. 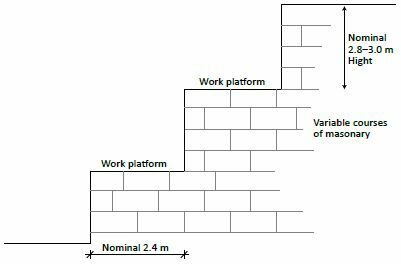 Therefore, it is proposed that on the southern side only, they created vertical ‘tiers’ with the core masonry with platforms of nominal dimensions 2.4 m wide and 2.8 m high (figure 9). This is a single-storey height that makes it easy for lifting blocks from one level to the next. It provides a safe working area for frames and scaffolds. On that level workers can have amenities, such as toilets, water supply and shade structures. Lifter devices would be used on each of these level tiers to allow continual delivery of the stones. These lifters could be simple wooden or metal devices using the fulcrum and lever principle (figure 10). A number of prototypes have been developed to demonstrate this. Human operators can lift large stones above a small height. The lifting is only required for each single storey height which makes it safe. The stones could be packed in metal or timber frames for ease of handling. They would be lifted individually and transferred from lifter to lifter until they reached the required level. When they reached their destination working level they would be placed on adjustable metal rails and glided to the required position. I believe the current height of the pyramid is the same as the original, and a pyramidion (pointed capstone) was not constructed. In stage two, the pyramid structure is formed as at the lower levels with the casing stones first and the infill behind, but the vertical tiers in the centre of the southern side prevent the completion of all these courses. 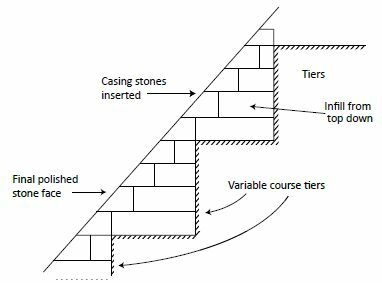 However, from the top it is possible to infill these courses from the top down (figure 11). Once the top has been reached, the southern side tiers can be in-filled from the top down (figure 10). 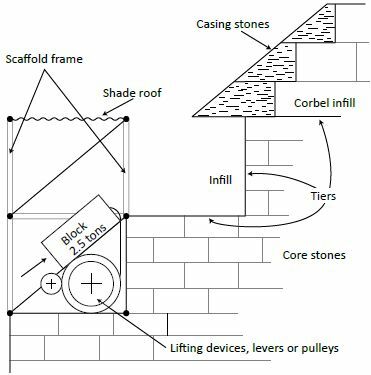 This requires matching courses of masonry and the casing stones placed level by level. No section is more than the nominal single storey (2.8m) in height, which is a safe working height. A simple method of corbelling often used in masonry work enables the courses to be bonded in layer by layer as illustrated in figures 9, 10 and 11. The only difficulty is maintaining the precision of the casing stones which are placed after the core stones are inserted behind. However this insertion technique is only required over relatively short distances (e.g. 30–40 m) depending on the number of vertical lifters formed. The precision of the placement of the casing stones is illustrated on the adjacent Kafre pyramid where some of the stones are still in place (figure 12). When the level of the construction ramp is reached, the ramp is then dismantled layer by layer and the materials and the mud bricks recycled. Figure 12. The top of the adjacent Khafre Pyramid shows the remains of some casing stones still in place, which illustrate the smoothness of the finished face. The subterranean passage beneath the pyramid (figure 5) was probably excavated below ground level at the time the base platform for the pyramid was prepared. With this two-stage proposal, all the other passages and chambers could have been formed as the stone blocks were placed into position and the work progressed. There are also the mysterious ‘star shafts’. These are a marvel in construction, as they penetrate through the core masonry as shown by the robotic exploration of Rudolf Gantenbrink.11 They would have been cut retrospectively with incredible accuracy. There are several large chambers and a Grand Gallery. The cutting out and lining of these spaces would be done just below the work platform. This would allow plenty of light and air for workers, and also the ability to check all alignments which are very accurate. Lintels and ceiling stones would easily be placed in position once the 64-metre level for the stones was reached. Very little lifting would be required. There has been some discussion that micro gravimetric measurements (X-rays) have shown lesser density in some corners and perimeter areas of the Pyramid.3 This may be due to different stone densities or cavities. If proven, these could be the remains of worker amenity areas in the course of the works. The ‘room’ recently rediscovered two thirds of the way up from the base in the north-east corner could be a supervision ‘office’ for northern and eastern sides. Hvala na objašnjenju i tekstu u spoileru, koji su veoma jasni i poučni. Moram priznati da ne razumem toliko mistifikacije oko nečega što se može saznati, proučiti ili o čemu je moguće doneti sasvim logične zaključke ukoliko se poznaje materija. Mogu da kažem i da razumem likove tipa Denikena i sličnih, koji spominju vanzemaljce i ostala čuda da bi zaradili novac, ali ne i stav mnogih ljudi da se ono što je trenutno nepoznato (sadržaj zapisa, šta se nalazi u nekoj prostoriji koja se ne sme otvarati na pomenuti način, lokacija neke grobnice i sl.) mora podvesti pod mistično. Ukoliko je nešto trenutno nepoznato, ne znači da mora imati natprirodno ili vanzemaljsko poreklo, već samo da treba istraživati i sticati nova saznanja. Pretpostavljam da si upucen u ove stvari koje postavljas, moze samo malo pojasnjenje, jesu li ova objasnjenja iz spojlera dokazana gradnja piramida ili samo nesto sto se pretpostavlja kao takvo? Mislim da je to jako bitno da naglasis. Moram da priznam da mi se najviše dopada, iako nisam siguran da je uopšte tačno, tumačenje jednog egipatskog inženjera da je velika Keopsova (kad kažemo "piramida" svi prevashodno mislimo na nju) samo jedna gigantska pumpa za vodu na solarni pogon. Ne bi bilo čudno da jedan tako važan irigacioni objekat postane i predmet/simbol obožavanja i kopiranja, ali bi bilo tragično da ostane samo to. Ono što je bez sumnje je da je izgradnja tog objekta koštala jako puno, ali smo mi danas nekako skloni da verujemo kako su te moćne države i društva bili "od budala, za budale" i da su se rukovodili jedino religioznim i iracionalnim motivima. I to zato što smo mi danas religiozno piramidalnom šemom zatucaniji od njih i sve što ne shvatamo tumačimo kroz tu religioznu prizmu, pardon - piramidu. Da li je velika piramida pumpa ili grandiozna investicija "javnih radova", ne znam, ali prilično sam siguran da je to što je grobnica (ako je uopšte?) ponajmanje važno. Edited by Hill Bill, 02 February 2014 - 06:37. Ironside, upravo htedoh da pitam za izvor, al’ me footnote odvede na pravo mesto (btw, zanimljivo da dolazi s creation(tacka)com sajta). No, iako opisano zaista veoma logicno i precizno zvuci, koliko sam upucena, ni jedna od teorija nije oficijelno priznata kao definitivna. Ili ne? (Samo da naglasim, moja dvojba nije u tome da li su tu mozda vanzemaljci umesali svoje pipke, vec samo i iskljucivo, oko toga koji je gradjevinski pristup bio u pitanju.To za vanzemaljce, bolje ostaviti Denikenu [kao sto pomenu DJ Vasa]). Ne mora automatski da znaci da su piramide napravili vanzemaljci. Mozda su Egipcani dostiglli nivo tehnicke civilizacije : koje su dimenzije kamenih blokova? Cisto sumanjam du mogle biti isklesane " rucnim radom" . I kako su mogle biti transportovane preko 2000-3000 km ( jer su izgradjene u pustinji- nigde kamena okolo, samo pesak), dakle verovatno su koristili mazge?! Zatim, se nesto desilo, bili su to neki lihvari te su uzrokovali bankrot strarog Egipta te je sve otislo do vraga! Zadnji tragovi su nestali paljevinom Aleksandrijske biblioteke u V veku nove ere. Pravo znanje je nestalo - ostale su samo interpretacije. Uz malo maste - to bi mozda mogla da bude alternativna istorija Egipta. Tekst iz spojlera je izabran jer je ilustrativan i nije previše tehnološki ekskluzivan. Ovo objašnjenje, kao i većina sličnih prihvaćenih, temelji se, prije svega, na arheološkim nalazima, sačuvanim pisanim svjedočenjima suvremenika i usporedbom sa sličnim graditeljskim pothvatima u usporedivo tehnološki razvijenim društvima. Pojednostavljeno, građevinska mehanizacija koja se koristila u gradnji piramida manje više je ista ona (najveći doprinos unapređenju tehnologije dali su Rimljani, kojih 2500 godina kasnije) koja se u Evropi koristila kroz cijeli srednji vijek i kasnije, do početka primjene parnih hidrauličkih dizalica na gradilištima u XIX stoljeću. Za ilustraciju, najveća gotička struktura u svijetu, katedrala u Kölnu, gradila se oko 6 i pol stoljeća, ali izvan okvira totalitarnog sistema kakav je bio faraonski Egipat (koji je mogao mobilizirati i do 100x više radnika u svakoj fazi izgradnje) i u vrijeme stalnih ratova i epidemija kuge, što je gotovo prepolovilo stanovništvo srednjevjekovne Europe. Što se tiče oficijelnog priznanja, znanstvena zajednica ne funkcionira kao npr. crkva, pa da izdaje oficijelni certifikat o valjanosti ovog ili onog tumačenja. Takav autoritet ne postoji i dobro je da ne postoji. Ovo i slična tumačenja prihvaća najveći broj stručnjaka za Egipat (arheolozi, historičari), a rasprave se vode o tehničkim detaljima (financije, logistika), a ne o, apage, vanzemaljcima . A što se tiče definitivnosti, pa, za razliku od tehnologije građenja, koja je manje više odavno poznata, tek nedavna iskapanja su potvrdila da se na gradilištima piramida nije koristio robovski rad, već plaćeni, kvalificirani radnici. Dakle, kako kaže (mislim Romer, nisam siguran) jedan egiptolog: "Zaboravite robove koji ujarmljeni tegle goleme blokove uz stalno pucketanje nadgledničkih bičeva. Taj posao su puno bolje obavljale volovske zaprege, sposobne da prevezu i najteže kamenje". Prosječna težina, oko 90%, blokova na Keopsovoj piramidi iznosi 2,5 - 4 tone. Najteži blok ima nešto više od 9 t.
Nisu se koristile mazge, već volovske zaprege sposobne da vuku desettonske blokove bez problema. Kad kažeš 'stari Egipat' na što točno misliš? Egipatske civilizacije su trajale gotovo 5000 godina i kraj im je bio sličan krajevima drugih civilizacija: bez praska i pompe, amalgamiranje u nove, emerging civilizacije. S požarom Aleksandrijske biblioteke nestali su brojni i neprocjenjivo vrijedni dokumenti, no ništa što bi iz temelja promijenilo naša znanja o metodama gradnje piramida. Pravo groundbreaking otkriće su bili arheološki nalazi koji su potvrdili da na izgradnji nisu radili robovi nego kvalificirani profesionalci. Large diameter copper tubes (as well as being made of other materials, including brass, tin plate, and soft steel) called coring barrels are used today by amateur lapidists for the coring of rocks and minerals (Sinkankas 1984). These coring barrels are generally thin-walled to reduce as much as possible the volume of rock that needs to be cut away. A coring bit is made by attaching the coring barrel to a wooden dowel, and the coring barrel can often exhibit a groove or gap along the length of the tube to allow new abrasive to more easily reach the cutting surface during use. Today, coring drills can be powered by an electric motor, but they can also be powered by hand, such as with a bow. In Egypt, a number of carpentry bowdrills have been found that were used by the ancient Egyptians (Fig. 1, Petrie 1974a). The bow was much wider at one end to allow for a handhold, and the drill-stock was made of wood, and sometimes contained a discharge hole to help eject the drill bit (Petrie 1974a, image). The capstone bearing was of wood or hard stone, and had a hole in one end for the insertion of the drill-stock. An example of a modern experiment in fire making using a replica of a small ancient Egyptian bowdrill is presented in the following website. Fig. 1. Ancient Egyptian bowdrill (after Wilkinson 1878). Many representations in Egyptian art of bowdrill usage is known (Singer et. al. 1954, Aldred 1978, Scarfe 1975, Stocks 1989). The first known depiction of the bowdrill is in the 5th dynasty tomb of Ty at Saqqara, however, the tool must have existed earlier since a number of bored wooden objects exist from the Early Dynastic Period (Nicholson & Shaw 2000). Examples of other depictions include a carpentry drill used for boring wood (Fig. 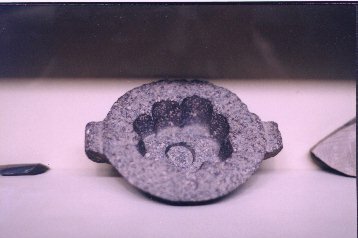 2a), and a lapidary drill employed in the manufacturing of stone beads (Fig. 2b, See Bead Making). Hand-powered stone borers were also used by the ancient Egyptians for the hollowing of stone vases (Petrie 1974a, 1977, Stocks 1993), and representations are found in Egyptian art (Fig. 3a-b). Fig. 2. a) Egyptian carpenters using a bowdrill. b) Beadmakers using a triple bit bowdrill and threading beads for a necklace. Both from a tomb at Thebes c.1450 BC (after Singer et. al. 1954). Fig. 3. a) Tomb representation of vase making using a boring tool. b) Tool reconstruction of type used in gypsum vessel manufacturing (after Hodges 1964). No tubular copper barrels or the wooden drill-shaft used for coring of rock have been found in the archeological record from ancient Egypt, or from Mesopotamia and Crete where rock coring was also employed (Stocks 1993, Warren 1969). For the copper barrel, this may be due to the wearing down of the copper tube to lengths that were no longer usable, at which point the remaining copper tube was recycled (Stocks 1993). The use of bow- and hand-powered coring drills as a method of cutting rock is inferred from marks observed on ancient Egyptian stoneworks, finished and unfinished stone objects, and pieces of waste rock. The cores (Fig. 5, UC44986, UC68247, UC44988, UC43723, UC43893, UC44987, UC44989, UC44991, UC55364) and core holes (Fig. 19, UC44990, UC16039,UC16038, UC33315, UC33317) are generally tapered (Petrie 1883), however, in the manufacturing of vases the walls of the core and core hole appear to be parallel throughout the cut (Fig. 6, Petrie 1974a, Stocks 1993; See Stone Vase Making). Both cores and core holes are often observed to be striated (e.g. an unfinished granodiorite porphyry bowl image). These striations are observed to be of the concentric and also spiraling variety (Fig. 5, Petrie 1883, Stocks 1999; 2001, Chris Dunn's website). The diameter of the cores and core holes vary from about 0.6 cm up to possibly 70 cm, and are dependant on the type of rock cut. Travertine (Egyptian alabaster) and limestone shows the smallest diameter cores, and igneous rocks are generally above about 5 cm in diameter (Petrie 1883). The largest diameter core holes are found in limestone and siliceous sandstone, with the largest being on the order of 45 and 70 cm (Petrie 1883; 1974a). The 45 cm coring bits appears to be used to dress down a platform of limestone, and the 70 cm bit could possibly have been used to cut a slab of rock, since the core could not be detached from the bottom of the core hole otherwise. The maximum length of the cores are restricted by friction forces generated by the rotation of the coring barrel, and clogging due to the build up of compacted tailings between the coring barrel and the walls of the core and core hole (Stocks 1999). Fig. 5. Granite core (UC16036) from Giza of 4th Dynasty date. (height. 11 cm. The Petrie Museum, Photograph by Jon Bodsworth The Egypt Archive) Note: Higher Res. image. Ancient Egyptian coring barrels would have been made of copper, either cast or cold-worked until the Middle Kingdom, when bronze tools became more readily available. Some ancient core holes still contain weathered copper or bronze residue and rock tailings/abrasive (Lucas and Harris 1962, Stocks 1986). The ancient Egyptians began to make tools of smelted copper by cold-working and casting starting around 3500 BC (Hoffman 1980). The technique of cold-working copper into sheets by hammering existed in early dynastic Egypt, where thin-walled copper vessels have been found (Petrie 1977). The ability of the ancient Egyptians to make copper and bronze tubes, either with sheeting or by casting, is demonstrated in examples of cylindrical vessels (Petrie 1974b) and pipes for plumbing (Wilkinson 2001). 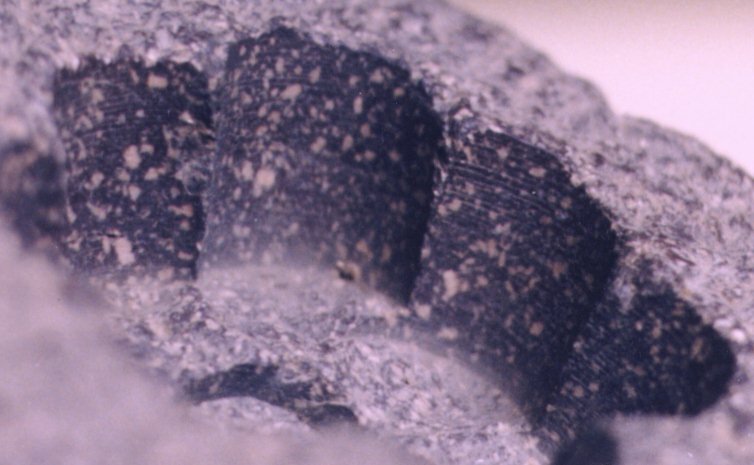 The thicknesses of the coring barrels are inferred from tubular slots left on the bottom of stone objects (Fig. 6), and were on the order of 1 to 5 mm (Arnold 1991). Casting of copper tubes with 5 mm thick walls can be accomplished with molds of sand (Stocks 1999). Copper and bronze are insufficient in terms of indentation hardness to cut by abrasion the majority of minerals in hardrocks such as basalt, diorite, granite, metagreywacke (slate/schist), and siliceous sandstone (quartzite). A harder material than the metal itself is required as an abrasive in order to cut these rocks. This abrasive material could have been used as shards of rocks or crystals used as cutting teeth, charged copper or bronze (abrasive impregnated into the metal), or as loose abrasive grains. It is unlikely that cutting teeth were used, since they would quickly loose their sharp edges, essential for efficient lapidary cutting of rock. It is unlikely that the ancient Egyptians had a ready source of mineral abrasives with hardnesses greater than that of quartz (Lucas and Harris 1962). The most likely abrasive is loose quartz sand, with its ease in replacing worn abrasive grains, as the main material used for cutting rocks for most of the ancient Egyptian's history. An example of a 4th Dynasty basalt fragment can be found at The Petrie Museum, in which the saw cut still contains rock tailings and sand (UC16033). 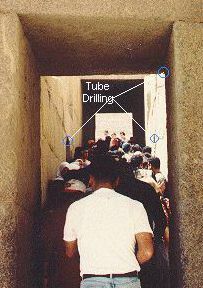 For examples of rock coring in ancient Egypt (see: Petrie, 1883; 1974b, Lucas & Harris 1962, Arnold 1991, Stocks 1999; 2001): a) Spy-holes in the a limestone wall of the serdab of Djoser at the north base of the Step Pyramid at Saqquara (3rd Dynasty, Fig. 7). 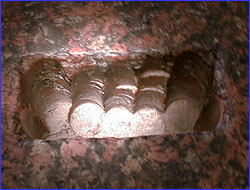 b) Core marks and peg holes on the sarcophagus in the King's chamber of the Great Pyramid (4th Dynasty, Stock 1999, Fig. 8, image 1, image 2). 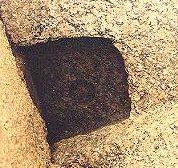 c) Core hole between the feet of the anorthositic gneiss statue of Khafre (4th Dynasty, Lucas & Harris 1962, Fig. 9). d) Sockets in granite from the Valley and Sphinx Temple of Khafre used for the ends of door-posts (4th Dynasty, image 1, image 2, image 3, Fig. 10). h) Marks on a granite sarcophagus with partial coring holes in a lid-peg socket (21st dynasty, image). i) Petrie gives many additional examples of core holes and cores (Petrie 1883). Drawing #7 Granite drill core found at Giza (Fig. 5.). Drawing #8 Part of a cast of a pivot hole lintel from a granite temple at Giza. In this example the core is not entirely removed, and remains to a length of 20 mm. Drawing #9 Travertine mortar (UC16038) found at Kom Ahmar, broken in course of manufacture, showing the core in place. Drawing #10 A small travertine core found with others at Memphis. Drawing #11 A marble eye for inlaying, with two core holes made with thin coring bits, one within the other. Drawing #12 Part of the side of a core hole in diorite (UC16039) exhibiting regular spaced grooves from Giza. Drawing #13 A limestone fragment (UC16041) from Giza, showing how closely holes were placed together to remove material by coring. j) Petrie (1974a) presents a number of examples. An unfinished travertine vase, exhibiting a core and core hole with parallel sided walls, in which part of the core is still attached (Fig. 12, UC33311). Fig. 12. Cross-section of an ancient Egyptian unfinished travertine vessel with parallel core and core hole walls (after Petrie 1974a). A tube cut from basalt (Fig. 13), which could be done by centering and cutting two core holes of different diameter and then detaching the tube. This is a method still used today by amateur lapidists for the making of cylindrical vessels and bracelets (Long 1976, Fig. 14). Another example of tube making by the ancient Egyptians is an Early Dynastic period metasiltstone ornamental bowl, the tube is left attached and the surrounding rock is removed (Fig. 15, image 1). Fig. 13. 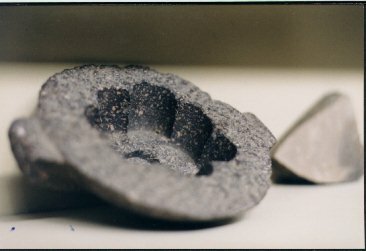 Drill core waste fragment made of basalt (UC44985), double cored to producing a tube, unknown date possibily 4th Dynasty. (height: 8.3cm, The Petrie Museum, Photograph by Jon Bodsworth The Egypt Archive) Note: Higher Res. image. Fig. 14. Modern coring of cylindrical shaped stone vessels (after Long 1976). Petrie (1977) also states that many stone vessels contain a tubular slot on the inside base, the remnants of the coring hole used in the initial stages of hollowing, similar to modern stone vessel manufacturing (Can narrow-necked stone vessels be made today?) 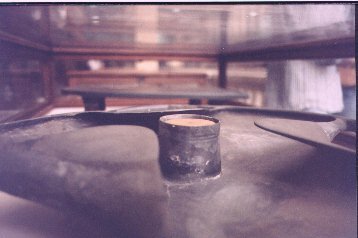 i) An example of a partially completed porphyry vessel on display in the Cairo Museum (JE18758), demonstrating how the coring drill was used to remove waste rocks in the manufacturing of stone vessels (Stocks 1999, image 1, image 2, image 3, image 4, image 5). 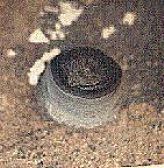 Eight core holes can be observed with 7 closely spaced around the perimeter of the inner surface, and one in the center, for which the tubular coring slot is still visible. This method of removing waste rock reduces the effort necessary for the manufacturing of stone vessels, and is a common time-saving technique still used today. Stone borers and drills were also used by the ancient Egyptians. 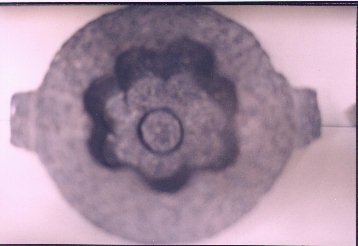 Lucas and Harris (1962) gives examples of drilling with copper or stone points, where the drill holes are still clearly visible. For example: a) Marks on two pieces of inscribed stone vases of diorite and dolomitic limestone, from the Step Pyramid at Saqqara (3rd Dynasty) b) Marks on a diorite bowl of Khaba (3rd Dynasty) c) The nostrils, ears and corners of the mouth of an alabaster statue of Menkaure (4th Dynasty). Many stone beads have been found with holes drilled for threading. Figure 16 presents a number of unfinished beads that contain holes from the Temple of Memeptah. Small flint drill-bits and borers, used in the manufacturing of beads, can be found at The Petrie Museum (UC14877). 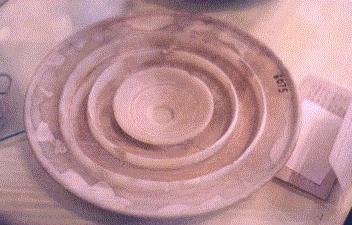 A limestone block with 10 boring sockets with circular striations and ridges (somewhat similar in appearance to those in a center cup of a 3rd Dynasty travertine ornamental dish from Saqqara: image) from the mastaba of Perneb at Saqqara (Arnold 1991). The holes are randomly distributed over the top of the block's surface with some slightly overlapping at the edges. Objects such as these may represent an underlying block used to bore completely through a number of rock object that rested on top of it (Arnold 1991), or possibly a waste piece of rock used to practice bowl or other stone vessel boring skills. The making of circular ridges during boring can be associated with changing of the borer's size during hollowing. An example of these ridges can be observed in a sectioned alabaster vessel (Fig. 17). Another example of multiple bore holes is a fragment of limestone with four bore holes found in waste rock near the pyramid at Meydum (Petrie 1974b). It is described by Petrie as a possible pivot for wooden levers used to move large blocks of stone. Petrie (1974b, Fig. 18) also describes a small fragment of limestone that has a number of randomly spaced partially completed core holes (Fig. 19). Stocks (2001) constructed a partial rotary-motion coring drill powered by a wooden bow (Fig. 20). The coring barrel was made of copper and was 8 cm in diameter, 1 mm in thickness, and was partially forced fitted to the wooden drill-shaft. A capstone bearing was carved out of a hard sandstone with flint chisels and punches, so that the rounded cone end of the drill-shaft could rotate with reduced friction when aided by grease, as well it acted as a weight. The wooden bow was made from a curved tree branch that applied enough tension to the bow rope to prevent slippage of the wooden drill-shaft during the coring experiment. Fig. 20. Representation of the coring drill used in the rock cutting experiments of Stocks (1993, 2001). A granite block from Aswan was used to test the coring drill. Initially, the surface of the granite was flattened by pounding with a diabase (dolerite) hammer. An outline equal to the diameter of the cutting edge of the coring bit was marked on the surface of the rock with red paint, and this outline was used to guide the carving of a shallow groove into the surface of the granite with a flint chisel and stone hammer. This was done to prevent the coring bit from slipping from the area being cut, during the initial stage of coring. This slippage was no longer a problem when the depth of the cut exceeded 5 mm. Stocks (1993, p.601) describes a travertine vessel with a similar type groove on the top surface located in the collections of The Petrie Museum (Fig. 21). The drilling was conducted by a team of three workman using dry sand as an abrasive. Two workmen operated the bow at either end, and the third held the capstone. As the bow was drawn back and forth, the motion produced 120 revolutions of the coring bit per minute (60 clockwise and 60 anticlockwise). A force of about 1 kg/cm2 on the end of the coring bit was needed to initiate cutting of the granite by abrasion by quartz sand. This was easily obtained by the workman holding the capstone, however, some difficulty was noted in keeping the drill stable and perpendicular to the granite surface during the reciprocating motion of the bow. This caused the granite rock core and the core hole to became tapered, as well as the core hole being overcut in the direction of the bow's motion. However, this effect was reduced as the core depth increased, and the overcutting of the core hole was kept symmetrical by changing the orientation of the bow during drilling. The dry sand abrasive (quartz) was added at the top of the core hole and some of it worked its way down to the cutting surface as the coring proceeded. Wet sand appeared to make the drilling more difficult than that of dry sand. When dry sand was used the tailings of the drilling process were removed by hand after extraction of the drill, and were found to be compacted on the sides of the copper tube. The rock core was removed from the core hole by hammering two chisels into the tapered groove, and the core was extracted in a single piece after breaking off near the bottom of the core hole. Stocks (2001) notes the presence of concentric horizontal striations. As in the case of the slabbing saw experiment, this may be the result of angular quartz fragments embedded in the copper coring barrel, or possibly the compacted tailings on the walls of the coring barrel. The striations were up to 2.5 mm in width and deeply cut, and are similar in appearance to those observed on some ancient Egyptian artifacts (Stocks 1999; 2001). The experiment took 20 hours to complete and generated a rock core 6 cm in length. A rate for cutting granite with dry quartz sand abrasive of 5.2 cubic cm/hour was obtained. 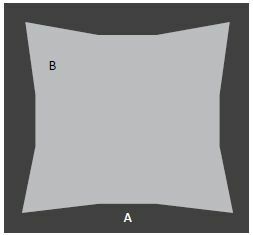 The ratios of volume, weight, and depth of removal between the copper barrel and the granite block are presented in Figure 22. Because of the inexperience of the work teams in these modern experiments, it was suggested by Stocks (2001) that the rate of cutting could be increased by a factor of 2 with gained experience. Fig. 22. Ratios of granite/copper lost during the coring drill experiment (after Stocks 2001). Stocks also conducted experiments on cutting limestone with bow-powered coring drills. The rate of cutting limestone with a copper barrel was 15 times greater than that observed in granite (Stocks 1999). The rate of copper loss would be expected to be very low, due to the similarity in hardness between the mineral calcite and copper. This was demonstrated by coring drill experiments conducted by Stocks (1993), in which a ratio of length of copper barrel lost from the drill bit to stone depth penetrated was less than 1:100. Copper tube coring drills would be very effective in the working of most limestones, since quartz abrasive is about 5 times the indentation hardness of calcite. Travertine, a limestone with a high rock hardness, would be more difficult to cut than a porous limestone due to its dense nature. These experiments demonstrate that the ancient Egyptians could have, using simple technology and the material available to them during their history, worked rocks with copper or bronze coring drills powered by hand or bow. It would be expected that for soft stones like limestone it was routinely used. In the case of hardrocks like granite, the expense incurred by the loss of copper during the cutting process would restricted it to royal monuments and stone objects, for usage where other tools would not suffice (Arnold 1991). The only large-scale usage of the coring drill was the manufacturing of sarcophagi (Arnold 1991) and stone vessels. Stocks (1989; 1997) proposes that the tailings of the cutting process could be used in the manufacturing of faience, from a water-based paste of calcite derived tailings (from limestone and travertine coring) and sodium bicarbonate (natron). As well, blue glazes can be produced from diorite and granite tailings. Both the blue glazes and the faience produced by Stocks resemble both in appearance and chemically those common to the ancient Egyptian's. Stocks (1993) suggests that granite tailings could also be used as a polishing abrasive because of its 0.5-5 micron grain size, and also as a abrasive for the drilling of beads. A grain size of 5 microns (0.0002") is ideal for lapping gloss finishes on rock surfaces, since the transition from frosted to semigloss lapidary finishes occurs with abrasives about 15 micron in diameter, and high quality lapidary polishes are generally done today with abrasive grain size of 6 (0.00025") to 0.5 microns (0.00002") (Craig & Vaughan 1981). upravo sam na to mislio kada sam pokrenuo ovu temu (boldovano)... Egiptolozi uporno tvrde kako su kameni blokovi transportovani..., klesani sa laserskom preciznoscu gde na spojevima (fugama) kam. blokova ni igla se ne moze provuci? Postoji i druga teorija, koja nije tako bajkovita kako neki Egiptolozi zele da ostane... da su kameni blokovi piramida ustvari vestacki kameni blokovi ( citaj geopolimerni beton ) koji je na licu mesta pravljen... gde se na crtezima koji se mogu videti u nekim piramidama, jasno vidi proces rada i gradnje piramida... radnik mesa beton, drugi kantama nosi beton i treci sipa taj isti beton u oplati od drveta i tako nastaju kameni blokovi i spojevi sa laserskom preciznoscu. Danas, znamo da se pravi takva vrsta betona koja se zove vestacki kamen i ne razlikuje se golim okom od prirodnog. Ovim nikako ne zelim da umanjim znacaj arhitekte iz starog Egipta, koji su u ono vreme imali status, da ne preteram, ali kao bozanska bica sa vizijom... isto tako i znacaj rimljanskog alhemicara koji je i pronasao sastav takve vrse geopolimernog betona... a ovo relativno novo otkrice da nisu robovi gradili piramide vec majstori, je zanemarljiva cinjenica u odnosu na jedno od svetskih cuda. Piramide u Egiptu. Edited by veciti putnik 2, 02 February 2014 - 11:34. Nisu se koristile mazge, već volovske zaprege sposobne da vuku desettonske blokove bez problema. !?! Mozes li danas da zamislis volovske zaprege koji vuku na sankama po pesku ( bez tocka ) desetotonseke blokove?